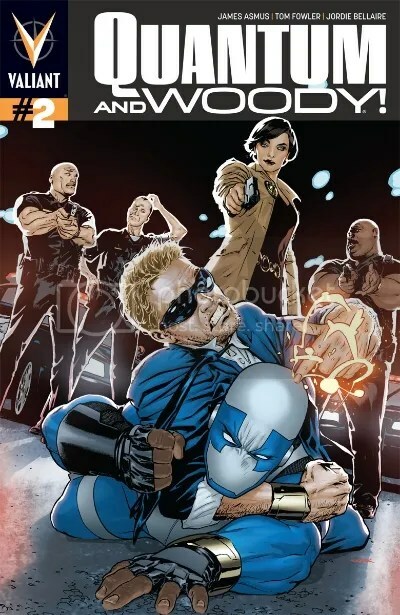 Picking up from where the last issue left off, Eric and Woody are naked, eccept for a golden band that Eric has on his left wrist, and Woody has on his right wrist, and surrounded by cops, led by a police detective who thinks they killed their father. During the melee that ensures, Woody discovers that he can fire yellow blasts of energy from his wristband, and Eric can form force fields made out of blue energy with his wristband, and tapping their wristbands together appears to make them both more powerful. Or something. It’s not entirely clear yet, but that’s okay because they’re still learning the limits of their powers, and therefore so are we. Back at Derek’s old home, Eric and Woody discover a video that Derek left behind for Eric, where he tells him that an organization called E.R.A. was after Derek’s work and were willing to kill him to get it. But before he could reveal more, Woody had accidentally recorded over the rest of the message. So they decide to try to get some answers by checking out Quantum Laboratories, the company Derek was working for, and Woody is the one who comes up with the idea for the two of them to wear costumes like superheroes. Eric wears his and adopts the name “Quantum,” but Woody changes his mind about wearing his own costume (because it looks “gay”). We get a glimpse of the woman in charge of E.R.A. and, well, I can’t really describe her, other than she appears to be some kind of living cadaver (she also makes a referce to “my detective,” could that mean that Detective Cejudo is secretly working for her?). She’s with a big Russian guy, who we recognize as the man who killed Derek last issue. And the woman sends two men, Johnny 1 and Johnny 2, to buy out Quantum Labs and attempt to get info about Derek’s work from the previous boss. Johnny 1 is a healthy adult male, while Johnny 2 is a midget-sized cripple in a special mechanical wheelchair with IV bags attached to it. When Quantum & Woody bust in, we see that Johnny 1 has some energy powers of his own, punching out Quantum with a glowing fist. And then little Johnny 2 activates some kind of parasite he’d sleeped into the Quantum Lab guy, which transforms him into a hideous creature called THE NIGHTMARE BRIGADE, which I cannot even begin to describe. Seriously, you HAVE to see it for yourself. For that alone I’d recommend this issue, which ends there on a cliffhanger, but there’s also that it continues the creativity from the first issue, and introduces us to multiple high concepts, without feeling like it’s trying to do too much at once. Writer James Asmus manages to straddle the line of comedy, action and drama, rather effortlessly, while Tom Fowler’s art is crisp, clean, and easy to follow. Two issue in, and I’m really diggin’ this series. FIVE STARS. Available in comic-shops but, c’mon, just go to Comixology.com and get it already.